In this lesson, you will discover tools that will help you make thoughtful decisions about the activities you select for your own program. Just like philosophies, there are also different types of activities. Activities can be adult planned, child initiated, adult facilitated, and spontaneous to name a few. Activities are the tools in your program, and they help the children in your care build new skills. You never know what the child you inspire today could become tomorrow! You could have the next 5-star chef, or future Olympian in your midst. The activities you select for your program will help the children in your care meet their developmental needs, and lay the foundation for their future learning. 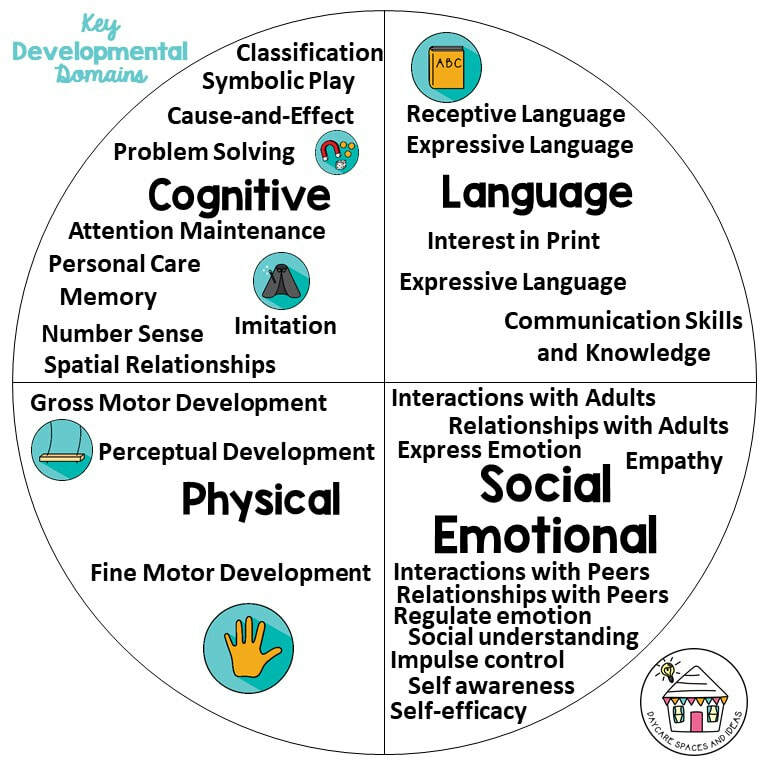 Many states offer developmental checklists which describe what skills children are learning by age in each developmental domain. Be sure to check with your licensing agency (even if you're exempt from licensing) to get your hands on great tools. One example is The Help Me Grow website sponsored by MN Department of Education. This site provides easy to navigate developmental milestone sorted by age. You'll find sample milestones for each age, as well as suggested activities you can do to can do to help the children meet their milestones. This knowledge will help you continue to challenge and support them in their learning. Observe and assess their individual needs. You'll want to observe the children throughout the weeks, and assess where they are in these key areas of development. It's through your observations, you'll take notice of what activities they are participating in, what materials the children are selecting, what questions are they asking, how they interacting with each other, with the space, and with you. These are the observations that will provide you the framework you need to select meaningful activities for your program. You'll want to develop a way to record these observations, and assessments that will allow you to stay on top of their ever changing developmental needs. There are a variety of ways to document their development: such as taking photos, recording videos, and creating a portfolio that contains samples of their work. As you are observing the learning that is happening, you can ask yourself: What materials are they learning to use? what process did the child use? What questions did they ask me? What skills have they mastered, and what are they progressing towards learning? If you set out an activity and you observe a child getting too frustrated-it may be too advanced. Or you may observe no one wants to play with the activity you set out -which may be due to the fact they've already mastered that skill. It's through your daily observations, that you will be able to select appropriate materials and activities for the children in your program. Children are already learning in so many way ways. The majority of your weekly learning activities don't come from the internet, Amazon, or a book. Even if you were to never log into the internet to find and plan activities-the learning would still be happening. As the facilitator, you have a very important role in your children’s lives. You are setting the stage for their very first learning experiences, and instilling a love for learning in the future. They are learning from the themes you have selected, the materials you select, and your suggestions. Children are learning as you teach, as you share, as you ask questions, and as you facilitate group activities. They are learning from you as you greet them, and learning as you show compassion. Children learn many skills when they are given the opportunity to play on their own. They are naturally learning as their bodies are changing and growing. They are learning when they complete a puzzle independently, or slide down the slide on their own. They are learning through the decisions they make about what they are going to play with, where they are going to play, and who they are going to play with. Children are learning as they are engaging in activities with their peers. You may find an older child lending a hand to a younger child while they are building together, or children working together in the dramatic play area to take on the roles of adults in their community. Make an effort to spend more of your time watching, and listening to the learning activities that are happening as the children problem solve with their peers. Be flexible, and provide large open blocks of time that allow the children to initiate their own group activities. The materials the children have access to, are teaching them about world around them. They are learning what things are made of, how things operate, and the cause and effect of their actions on these items. These materials provide them with their first opportunities to experiment in Science, Math, Engineering, Art, and are helping to build a strong foundation for their future development and abstract thinking. They are learning from their environment. Your space and the materials in it extend their learning, enhance their learning, and encourage them to explore and build deeper connections. Creating learning centers in your space (Art, Construction, Dramatic Play, Science, Math, Reading Areas, etc.) provides an opportunity to use your space to teach. You can find several examples of learning spaces on my site as well as suggested items you can add to each space. With your theme in place, and an understanding of the developmental goals of the children in your care-it will be much easier for you to choose adult selected activities, and learning materials for your program. The activities you select are important tools. They should help the children meet their developmental needs, expose them to learning new things about the people and the world they live in and help them learn to respect themselves and others around them. The activities should encourage them to use their own creativity to create new things, solve problems, and give them opportunities to learn practical skills. The activities you select should offer the children a variety of interesting ways to learn, and make learning fun. Incorporate their senses: Choose activities that give children opportunities to touch, see, smell, taste and hear the world around them by including "real" objects in your space. If you are studying pumpkins you can paint pumpkins, weigh & measure pumpkins, explore the insides of pumpkins, count pumpkins, pretend to sell pumpkins, compare different pumpkins, eat pumpkin pie. Talk about how pumpkins feel, and even smell the pumpkins. Personalize your activities: In a family theme you could discuss their own parents names, and talk about their own siblings. In an all about me theme you can explore the letters in their names. Integrate the learning and skills: Rather than teaching skills independently you can integrate them to make them more meaningful. For example children can learn letters through a game they are playing, or by looking at the letters in their name on their artwork which will make much deeper connections than exploring an individual letter independently. You can incorporate learning about colors, numbers, and letters in the songs you sing at circle time, and the games you play throughout the day. Integrated and meaningful learning makes greater connections. Combine tools & materials: You should combine your tools, and materials so that you challenge the children in different developmental areas-while they are participating in a single activity. For example: In a sensory bin you create to teach children about colors, you can also include tongs or clothespins to improve fine motor skills, and you can add variety of different textured color items. Choose open ended activities & materials: Open ended toys and activities have no "expected" outcome, and no "right way" to use/do them. Therefore you focusing on the learning process that is happening. You can do a simple search using your theme + the developmental goal to find a plethora of suggested activities. If you have chosen to follow along with my lesson planning calendar (or just need ideas for your theme), I have done a lot of this work for you. On my site you can find theme planning idea pages that contain suggested activities for 52 Themes. When you click on each of my links it will bring you to a resource page full of ideas with suggested activities for the developmental domains. You may also want to consider a Pre-K Printables club membership which gives you unlimited access to the Daycare Spaces and Ideas library of printable activities where you can find over 1,000 printable activities covering over 52 Themes! Onceyour account is set up, you simply download, print and assemble these fun hands on learning activities at your leisure. ﻿﻿Find out more about the club here﻿﻿. 1. Select adult facilitated activities based on the "average" aged child in your care. From here you just need to adapt the activities for the younger children, and older children. For example a younger child may be able to participate in the same group craft if you prepare some of the materials in advance. An older child with cutting skills may be able to independently cut out the materials on their own leaving you time to help the younger children in your care. As a home based provider, you are most likely working independently-and can always use an extra set of hands! Don't overlook the opportunity your environment offers to teach the children new skills. A carefully designed dramatic play space, a library/reading area full of interesting books, and a shelf curated with age appropriate fine motor activities and games will engage the children while at the same time challenge them to improve their skills. Treat your space like a buffet (as opposed to a 5-course sit down meal). Create a space that is free to explore, rather than directing children from activity to activity. I recommend that you take it a step further and don't plan for ANY adult directed activities on Monday & Friday (or those days you are extra busy with your own family commitments). Does that mean no learning happens on those days? No. It means that you plan on setting out open ended materials and activities that don't require you to facilitate them. Rather than prepping a craft that you need to gather materials for, and prepare, you could instead: set out finger paint, or play dough with cookie cutters. Rather than setting up a pumpkin themed sensory bin, you can provide them just pumpkins to freely explore (touch, smell, weigh, sort, etc). Rather than testing them on concepts, you can set out an alphabet letter matching activity, or color matching game for them to explore independently throughout their day. 4. Allow children who have mastered their skills to work independently. Sit with the child who is still progressing in learning to use scissors, and allow the child that has mastered this skill to do it independently. Once a child has mastered a skill, you may also notice them wanting to take on the role of teaching. This is one of the great benefits of a mixed age group learning together. As long as your children are still learning and progressing-it's ok to repeat activities throughout the week, and month. In fact, when children repeat activities as they are mastering new skills they are actually gaining more confidence, and making connections in their brain. It's ok to read the same book every day. It's ok for them to play with the same sensory bin. It's ok to make 20 paintings using the same color paint. Allow children to explore new things, create new things, move their bodies, sing (with you!) and read every day. Let your children be your guide to selecting activities. Recognize, observe and record the learning that is happening around you. Choose a variety of meaningful activities, and challenge yourself to find new ways to meet the needs of the children in your care. This weeks assignment is to choose three developmental goals your children are progressing towards, and three activities (related to your first weeks theme) that are going to help the children in your care meet these goals. Please swing by our group to share your homework response on this post..